Since the New Year we’ve been pinning hundreds of images onto our Pinterest boards, many of which are incredibly detailed and decadent. Studying all of these pictures led us to start analysing how you achieve a truly luxurious tablescape for a wedding – something that we automatically do for our clients as part of our brief. Your venue should provide you with a white linen tablecloth however, they rarely reach the floor. Tables that are clothed to the floor look so much more elegant and luxurious, as do coloured cloths, in the right scheme. Your venue, stylist or product hire company should be able to order you an alternative to the venue’s own standard linen. You can elevate the look further by using a beautiful runner across the table or topper in the centre. Some venues will use as many as three or four glasses as part of their standard table set up which looks very extravagant compared to tables we set at home! Hiring coloured or highly decorated glassware is the next step up and really transforms a tablescape. If you have booked a design-led venue then they are likely to use beautifully designed crockery and cutlery. If you are providing your own catering then definitely ask your caterer what they will be supplying, as you may want to hire alternatives to elevate the look of your tables. There are lots of attractive ways of displaying table names and numbers including ornate frames; all of which are a huge step on from chrome stands. Pinterest is a great source of inspiration for items to match your look. This doesn’t necessarily have to be a floral centrepiece as there are lots of candle centrepieces available to hire that won’t break the bank. Our previous article has lots of advice about table centres. Low level candlelight really adds to the decadence of a table when the light begins to drop. The use of candles generally can transform the ambience of a room from the afternoon into the evening. Votives can also be used for flower heads as part of a ‘scatter centrepiece’ or placed around the base of a tall floral table centre. 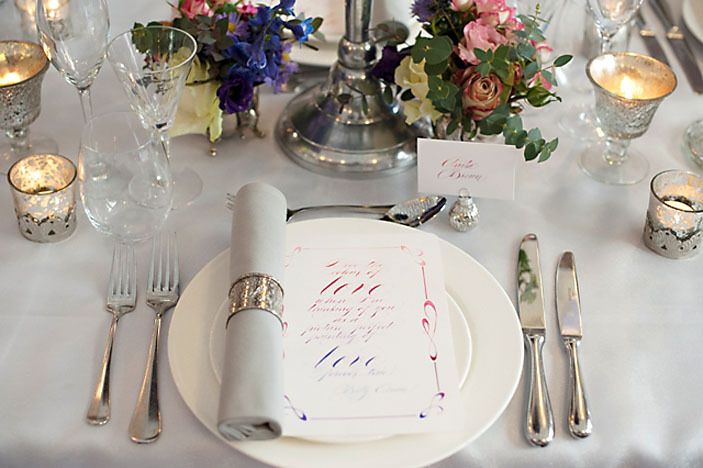 A coloured napkin folded, or placed, in an unusual way is a great means of adding interest to a tablescape. Again, coloured napkins can be hired or made quite inexpensively if you are handy with a sewing machine. You can order place name holders from hire companies that add to the opulence of your place-settings, particularly when they are coupled with an exquisite, bespoke name card. Menus mounted on coloured card or embellished with gorgeous details, look fantastic placed around the edge of the table for each guest. This is one of the easiest ways of introducing colour into you tablescape and avoids the expense of coloured table linen. Last but not least, a personal wedding favour in luxurious packaging can really add to the appeal of a place-setting, not to mention the “oohs” and “aahs” it generates when guests discover their little gift. We do have a few exceptions to ‘layering up’ up your decadent tablescape and they are wine coolers, excessive bottles of water and coffee cups and saucers! All of which can be brought to the table by the waiting staff when it is required. Don’t go to all the trouble of creating a luxurious tablescape for it to be cluttered up by the venue to save their staff walking a few extra feet.